Stems: Prostrate, much branched and sometimes forming large mats; branches 2 to 20 inches, glabrous. Leaves: Cauline, alternate; petiole absent; blades flat, obovate or spatulate, .24 to 1.2 inch long, .08 to .5 inch wide; apex rounded to nearly truncate; involucre-like leaves 1-4. Inflorescences: Terminal, flowers in small, dense clusters or solitary. Flowers: Radially symmetric, .12 to .4 inch diam. ; sepals 2, broadly ovate or round, .11 to .18 inch; petals 5, yellow, oblong, .12 to .18 inch; stamens 6-12; stigmas 3-6. Fruits: Capsules, ovoid, .16 to .35 inch; seeds many, black or dark brown, round or elongate, less than .04 inch diam., minutely rounded-tuberculate. Uses: Although considered a weed, common purslane has been eaten by peoples of Europe and Asia for thousands of years and is still grown as a garden vegetable in those parts of the world. 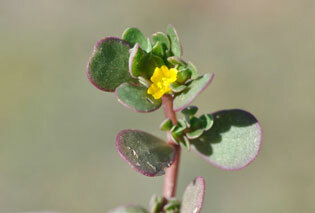 The herbage of purslane may be used in fresh salads, as a cooked green vegetable, or for pickling, while the seeds may be ground and used for flour or cooked as mush. Comments: Portulaca, little door, alluding to the capsule lid and oleracea, resembling a garden vegetable.